Now that Gog is a “coalition of nations” and things are heating up with Russia, once the GB get the word from their globalist world war planners, they can give themselves a final boost of “new light ” credibility and forecast a Russian led “coalition” of BRICS nations for “the end” as King North and Gog all in one. 1. The premature end delusion of 2 Thessalonians 2:1-2 will then turn into a final GLOBAL JW HOAX, to cloak Bethel’s required corporate destruction as if “the end brothers!”. A. In reality, it is Daniel 8:13-14 beginning timing of the final temple judgment as Daniel 11:41 global JW organization real King North world government boys “invasion” by yes, a giant “coalition of nations”. B. It will really look like “the end” to JWs, until they notice that “end” has not arrived as soon as expected in that main Bethel delusion by misapplied, over-adavned prophecy error. 2. The JW ministry can be globally cancelled from Bethel’s “lawless one’s” own mouth. And that is how the JW “constant feature” is also “trampled” in Daniel 8:13 temple indictment. 3. Gog and King North can converge as recently set up in the JW mentality. 4. JWs will be out “standing up straight” for an expected quickie “deliverance”. A. In reality that will take more years, Daniel 8:13-14 is what runs its full course first as the required temple judgment on UN NGO Bethel, given to the King North UN planners for premature cessation of the JW ministry and takeover of the JW organization corporate “established place” of Daniel 8:11. They way JWs “expect Daniel 11:44 King North attack next brothers!” “whoever he may end up being” is accomplished by continuing to tell JWs King North is the failed USSR, and that a failed and bankrupted USSR fulfills the King North requirements of Daniel 11:36 and Daniel 11:42-43. In this manner JWs are BYPASSED over the future Daniel 11:41-43 required King North world governemnt progress sequence. In this manner Daniel 11:41 visible invasion of the JW organization, can be presented to JWs as Daniel 11:44 “attack”. And in that manner JWs will think the end sequence of Daniel 11:44-45 has actually begun. interesting indeed…have you noticed that russia has now banned JWs?! Yes, they have to keep the Russia drama prop by now post Cold War revisiting the tension in new manner and rehyping the nuclear war stuff for the final cycle. But KING NORTH is world government not Russia and obviously not the USSR or Asia for that matter, Since globalition is the Rev16:16 main “gathering the nations to Armageddon” “inspired utterance” ALL the nations must become part of 8th King King North WORLD GOVERNMENT. 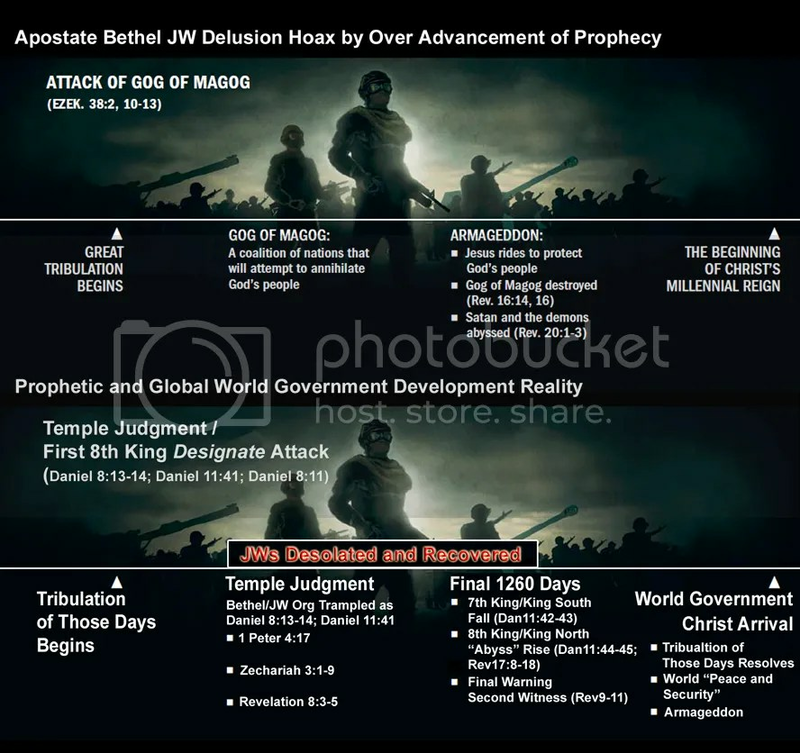 And it is so obvious all prophecy converges to WORLD GOVERNMENT as the final sovereign rival, JW Bethel is obviously covering up current news and prophecy progress on purpose, so they have to be broadsided to get rid of their Rev2:2 liar “apostles” like, but not limited to, the GB.